The State Commission on Judicial Performance unanimously recommends that Judge David M. Furman BE RETAINED. 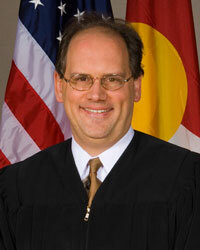 Judge Furman was appointed to the Colorado Court of Appeals in 2005. He graduated from Wheaton College in 1982 with a Bachelor of Arts in psychology and Christian education, and in 1989 received both a master’s degree in Social Work and a law degree from the University of Denver . He was the Editor of the Juvenile Law Column of the Colorado Lawyer and on the Executive Committee, Juvenile Law Section, Colorado Bar Association. He is co-author of the Judicial Benchbook on Colorado Child Welfare Law, A Handbook for Families in Dependency & Neglect Cases, and What Happens to Me Now? A Handbook for Colorado Children Who Are Not Living at Home. His community activities have included serving as chair of the Colorado Children’s Trust Fund Board, and as a member of the Arapahoe/ Douglas Mental Health Network Board. He has also been an Adjunct Professor and Lecturer at the University of Denver Graduate School of Social Work and an Adjunct Professor at Colorado Christian University . Prior to his appointment to the Court, Judge Furman served as a magistrate at Denver Juvenile Court for four years. He was in private practice from 1995 to 2000, and before that served five years with the Colorado Public Defender’s Office. Judge Furman is organized and methodical in his approach to his work. Attorneys who responded to survey questions rated Judge Furman significantly above the average for refraining from reaching issues that need not be decided, and at or near the average in all other respects. Judges rated him as comparable in all respects to other appellate judges. Attorneys commented that he is fair and capable, while judges praised his expertise in family law. Judge Furman strives to be both polite and succinct in his questions during oral argument, and studies techniques for writing more clearly and concisely. The Commission also reviewed various opinions that Judge Furman wrote. His opinions were generally well-organized and well-reasoned, and reflect a respect for precedent and the limited role for the Court of Appeals. Overall, 92% of attorneys surveyed and 97% of judges surveyed supported Judge Furman’s retention, with 83% of the attorneys and 76% of the judges strongly recommending that he be retained in office.